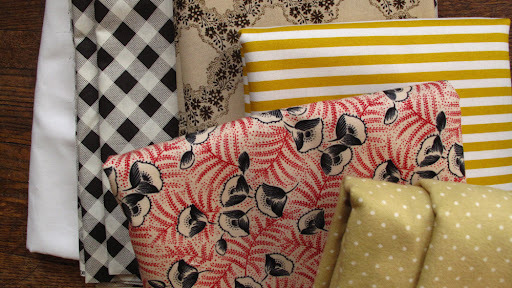 My world was forever changed when I discovered Marden's fabric department in Sanford, Maine. An hour and a half from Boston in an unassuming town in quite the unassuming, mostly abandoned, shopping center is Marden's, a discount/overstock retailer. This is the kind of place that has to be a treasure trove, and it is. Inside just this location is a large fabric section, run by a woman who loves her job, Bonnie. At first, I wrote the fabric off as cheap calicos but as I delved in deeper I discovered fabrics by Nancy Grere that I'd bought for $10 a yard elsewhere - here they were for $3 a yard. Then I found more. Then I found Michael Miller and then I had a stack of $85 worth of $3/yard fabric. Bonnie told me they would been soon expanding the department to carry notions and machines. Since my visit a friend has been and confirms the expansion has happened. If you're in Boston, this is a great resource. Worth a trip on it's own and certainly worth stretching out a trip of York or Wells to go to.